Macy’s revealed a few of their top 2017 Black Friday doorbuster specials. The limited-time deals listed below will be available in-store beginning at 5 p.m. Thursday, Nov. 23 through 2 a.m. Friday, Nov. 24; Friday, Nov. 24 from 6 a.m. through 1 p.m.; and Saturday, Nov. 25 from 8 a.m. through 1 p.m. (visit macys.com/stores for local information as Black Friday hours may vary by store. Most Macy’s stores will open at 5 p.m. on Thanksgiving evening). 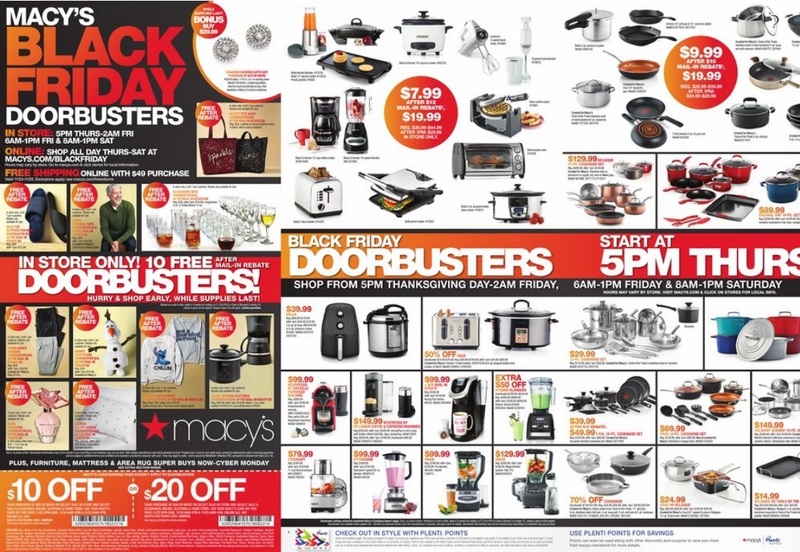 Macy's full Black Friday ad varies by location, so visit Macys.com to view your local Macy's weekly ad flyer. For shoppers looking to get a head start on their Christmas lists, Black Friday prices will be available at macys.com Thursday through Saturday.